Richard Sanders, Kansas Department of Wildlife, Parks and Tourism fishery biologist, shows a largemouth bass that was netted by KSU wildlife specialist Charlie Lee after being shocked from KDWPT’s specially-equipped research vessel. 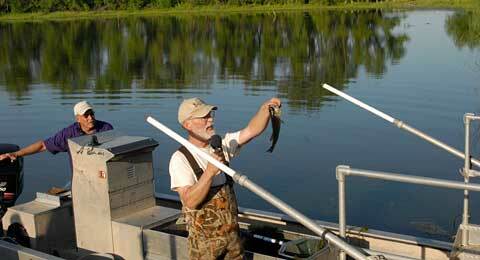 During the warm evening of June 11, about 90 people gathered near Vassar at a private pond owned by Ted Hazelton, to see a shocking demonstration: Richard Sanders, fishery biologist with Kansas Department of Wildlife, Parks and Tourism, and Charlie Lee, KSU wildlife specialist, boating around an Osage County fishing pond. The shocking part consisted of electrodes extending from KDWPT’s specially-equipped research vessel, which is used to determine sizes and populations of fish in a body of water. With Sanders as captain and Lee manning the net, they boated around the 8-acre pond, shocking and sampling from different areas. Once docked, Sanders showed the crowd gathered on the pond’s dam that most of the fish caught were bluegill or other panfish or small largemouth bass. Following the shocking demonstration, Sanders and Lee talked about pond management for developing different types of fisheries, and control and options for aquatic weeds. Sanders advised Hazelton the sampling showed pond conditions were perfect for panfish and the fun fishing they provide, but the bass population included many small-sized, indicating the need to remove some to encourage growth of larger bass. 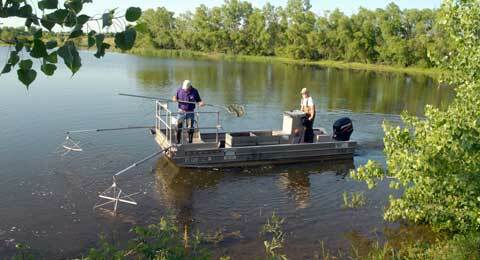 Lee said Hazelton’s pond had almost perfect pond vegetation to provide suitable cover for a healthy fishery. The demonstration was hosted by Frontier Extension District, which also provided a hot dog meal enjoyed by attendees from all around northeast Kansas. Charlie Lee looks for shocked fish to net as Richard Sanders steers KDWPT’s research vessel near shoreline cover in a large pond near Vassar.